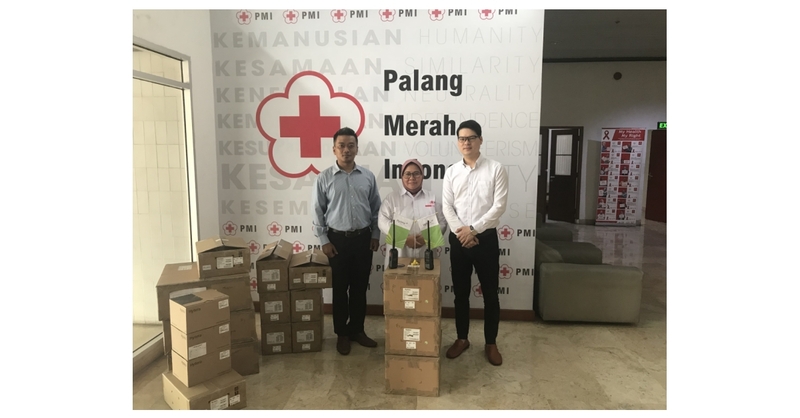 JAKARTA, Indonesia–(BUSINESS WIRE)–To help improve collaboration efficiency in the search, rescue and evacuation, Hytera donated communications equipment in the first minute to Palang Merah Indonesia (PMI), the Indonesian Red Cross, following a magnitude 7.4 earthquake and a tsunami rocked Central Sulawesi in Indonesia on September 28, 2018. According to the National Disaster Management Authority (BNPB) on October 4, the earthquake and the following tsunami has caused 1558 fatalities, 2549 injuries with 70821 people displaced and 65733 houses damaged. The earthquake as well as the tsunami, liquefaction and landslides triggered by the quake caused great damages to the power supply and public communications networks in Central Sulawesi. Hytera’s innovative emergency communications solutions, which can be deployed in a minimum time, prove to be efficient in setting up temporary communications networks in emergencies. As a leading global provider of innovative Professional Mobile Radio (PMR) communications solutions, Hytera is committed to fulfilling its social responsibilities by leveraging cutting-edge technology and product portfolio to support rescue and relief operations on a global scale. Hytera played an active role in providing support to emergency response efforts such as the Japan Tsunami in 2011, the Nepal Earthquake in 2015, the floods in Myanmar in 2016, Hurricane Harvey in Houston, Texas in 2017, Laos Dam Collapse in July 2018 and Lombok earthquake in August 2018. Hytera Communications Corporation Limited is a leading global provider of innovative professional mobile radio (PMR) communications solutions that improve organizational efficiency and make the world safer. Founded in Shenzhen, China in 1993 and listed on the Shenzhen Stock Exchange (002583.SZ), Hytera has ten research and development centers around the world. Hytera serves customers in over 120 countries and regions, including government, public security, utility, transportation, and enterprise. Sepura Group PLC and its subsidiary Teltronic S.A.U. became a part of Hytera in May, and Norsat International Inc. and its Sinclair Division became part of Hytera in July 2017. For more information, please visit www.hytera.com.